Hair loss is a common condition that affects people of all ages. Statistics show that world-wide, over 1.2 billion men suffer from hereditary baldness. This condition may impact a man’s self esteem and confidence. For many years, balding patients have been searching for a minimally invasive and virtually pain-free procedure to restore their natural hair. Patients feared artificial-looking, obvious results. Even now, older and more traditional hair transplant procedures are invasive, requiring stitches with prolonged and painful recovery. These procedures leave patients with an obvious linear scar, often requiring a longer hairstyle to conceal. Side effects may include residual and lasting scalp tightness, and potential nerve injury in the donor area. There are other manual handheld methods that depend entirely on human eye-hand coordination. One of the many risks include human error and a high degree of human fatigue. Visualization of the treatment area is limited to what can be interpreted by magnification glasses. This repetitive manual task loses consistency and quality over time. The ARTAS™ Robotic Procedure was designed with you in mind. Developed with leading hair transplant physicians and researchers, this state-of-the-art technology was created to eliminate the guesswork and fatigue associated with manual handheld methods, along with the scarring, complications and downtime of existing invasive surgical techniques. Unlike older transplant methods, no stitches are required, rendering your procedure nearly undetectable. You can now expect natural-looking results without the side effects and recovery times resulting from older techniques. Overcome the negative stigma associated with traditional hair transplants and reap the benefits of this revolutionary, physician-controlled technology. During the initial stage, hair is selectively harvested with robotic precision providing consistent graft dissection. Advanced robotics provide speed and harvesting accuracy unavailable with manual handheld techniques. The ARTAS™ System uses Recipient Site Making to implement your treatment design which is carefully created with the ARTAS™ Hair Studio Technology. Using the process of robotic Recipient Site Making, the ARTAS™ System protects your existing, healthy hair. Survival and growth rates of the transplanted hair depends entirely on the meticulous creation of these robotic recipient sites. During the consultation, your physician will use the ARTAS™ Hair Studio Technology to create a customized hair transplant design as a 3D model based on your personal photographs. 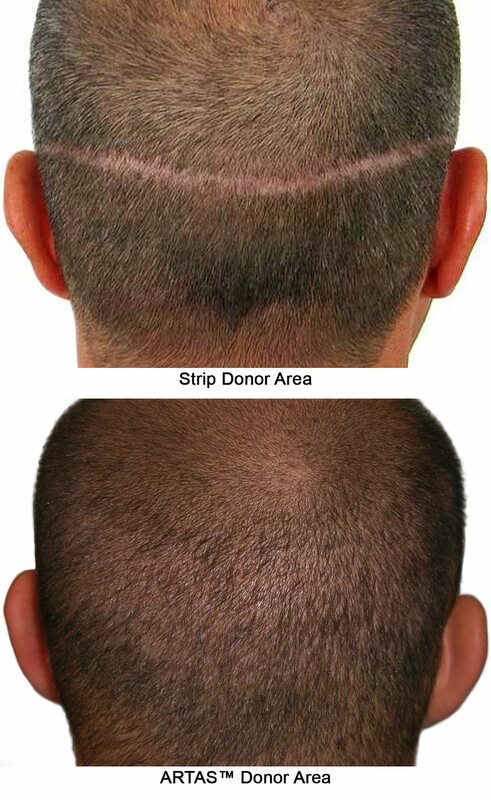 Different aesthetic outcomes require different graft numbers, distribution and placement of your transplanted hair. Using ARTAS™ Hair Studio, you will see the optimal number of grafts and hairline design needed to meet your expectations. No guessing is required. Together you can make a decision based on your needs and your physician’s recommendations. Your clinician will take photos of you to design a customized hair pattern and illustrate aesthetic options. You will see the potential results if your grafts are placed in different areas of your scalp and how increasing your hair fullness and improving your hairline design will change your appearance. Being able to view these different options helps address a fear of the unknown by enabling you to preview your potential outcome and see what you could look like with your new, permanently growing hair. If they are part of your decision-making process to choose to have a procedure, your spouse will also benefit from seeing what you could look like after your ARTAS™ Robotic Procedure. It is very helpful to actually see what your physician is describing vs. having to use your imagination and hope for the best. This process may help to build your confidence by presenting you with an achievable, desirable aesthetic outcome. Men who decide to have a hair transplant benefit from understanding what is realistic and reasonable given their degree of thinning or baldness, facial structure, age and desired result. The physicians using ARTAS™ Hair Studio use their expertise and medical judgment to advise you and assist you in making the best decision. Minimally invasive robotic harvesting is a state-of-the-art, proprietary hair transplantation advancement available exclusively with the ARTAS™ Robotic Procedure. ARTAS™ Artificial Intelligence™ algorithms are used to identify and select your prime hair for harvesting, while maintaining the appearance of your donor area – all under the control of your physician. These capabilities are available only with the ARTAS® Robotic System. Other hair transplant techniques cannot offer these highly sophisticated technological advancements. The ARTAS™ Robotic Hair Transplant, an outpatient procedure performed in the doctor’s office, requires only a local anesthetic. The patient feels virtually no pain. Some patients can experience minor discomfort and swelling post-procedure, which subsides in one to three days. Recovery time with the ARTAS Robotic Hair Transplant is less than with most surgical cosmetic procedures. As there is no surgical incision or stitches required with the ARTAS Robotic Hair Transplant, healing time is short, and you can usually go back to your daily activities after a day or two.